DEEP EXTREME Indonesia 2016 marks its 10th anniversary this year. Miguel’s Diving will be there to help celebrate! We remember the first DEEP expo. We have been operating for over 13 years now. Gorontalo Province has invited Miguel’s Diving to provide banners for its booth. The booth location is D-7A. 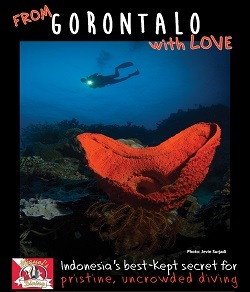 This year’s theme is “From Gorontalo with love.” The back drop photo is courtesy of Jevin Surjadi. He discovered an unusual sponge. It is red and heart-shaped. Its secret location is at one of the unnamed dive sites that we use. As in many previous years, DEEP EXTREME Indonesia 2016 will be held at the Jakarta Convention Center. The dates are 31 March to 3 April. The expo combines scuba diving with extreme sports, such as rock climbing. It is now the largest expo of its kind in Southeast Asia. At DEEP EXTREME Indonesia 2016, we are offering discount dive packages. Drop by to see us! The Gorontalo booth for DEEP EXTREME Indonesia 2016 contains dramatic photos from Gorontalo. Some are wide angle shots, such as the view from inside Jinn Caves. Others are macro shots. Gorontalo is a great place for both types of underwater photos. At special request of Ibu Resma, Provincial Head of Tourism, is a special underwater photo. It is a Salvador Dali sponge shaped like a dragon. She says it looks as if a magical spell was cast on a ferocious dragon. Right before the attack, it was turned to stone. For your chance to see this giant sponge in person, please book your dive trip with us.